88-key digital piano with high polyphony. The Kawai KDP110 boasts numerous areas of improvement and innovation within its offering in the KDP110 this price range. 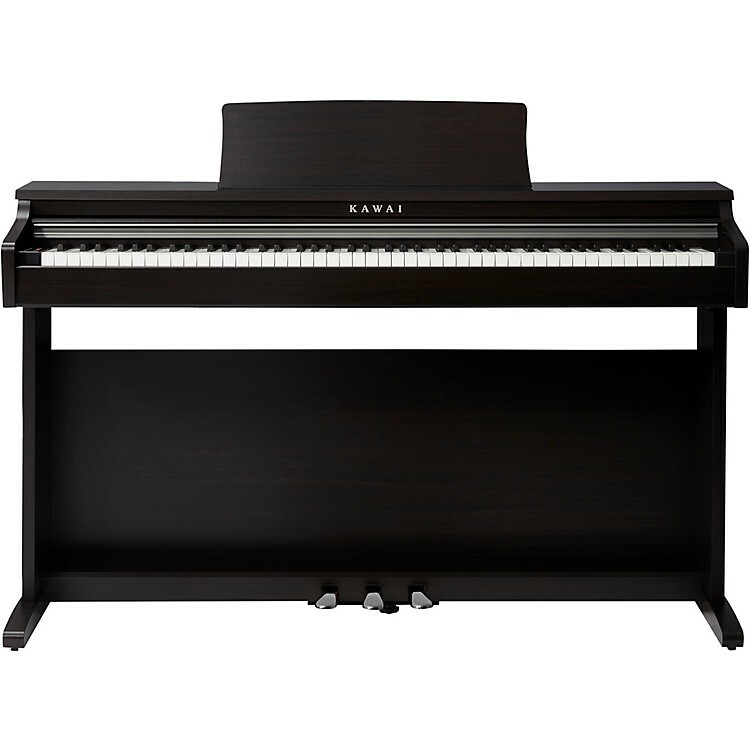 As always, Kawai has let their decades of experience crafting fine acoustic pianos guide them in designing the touch and sound of their digital pianos. The KDP110’s newly designed Responsive Hammer Compact II (RHCII) keyboard action has been developed to represent the distinctive touch of an acoustic grand piano, more specifically, Kawai’s acoustic pianos. The KDP110’s springless key mechanism, sturdy construction, and accurate triple-sensor system delivers a smooth, natural, and highly authentic piano playing experience, even in the unforgiving glare of solo performance. And, just as an acoustic piano uses heavier bass hammers and lighter treble hammers, the RHCII keyboard action also employs different hammer weights that are perfectly graded for each playing range. It is this level of attention to detail and the astonishing realism it supplies that informs the KDP110’s sound and feel. Other manifestations of Kawai’s obsession with piano realism can be heard in the KDP110’s particular stability during sustained fortissimo passages, while preserving delicate pianissimo control, to satisfy the demands of most discerning pianists. The KDP110 digital piano captures the beautiful sound of the acclaimed Shigeru Kawai SK-EX concert grand piano, with all 88 keys of this exceptional instrument meticulously recorded, analyzed and faithfully reproduced using proprietary Harmonic Imaging technology. This unique process accurately recreates the broad dynamic range of the original grand piano sampled from the softest pianissimo to the boldest fortissimo. In addition, the KDP110’s Virtual Technician function allows the overall character of the SK-EX piano sound to be changed to suit a particular musical genre, or for individual elements such as voicing to be adjusting using the dedicated iPad app. Complementing its authentic keyboard action and rich grand piano sound, the KDP110 offers a variety of useful digital features. For aspiring pianists, the integrated metronome, lesson songs and dual headphone jacks ensure that practice is both productive and engaging, while USB and Bluetooth® connectivity allow the instrument to communicate with computers, tablets, and smartphones. Beautiful sound and touch. Order today.